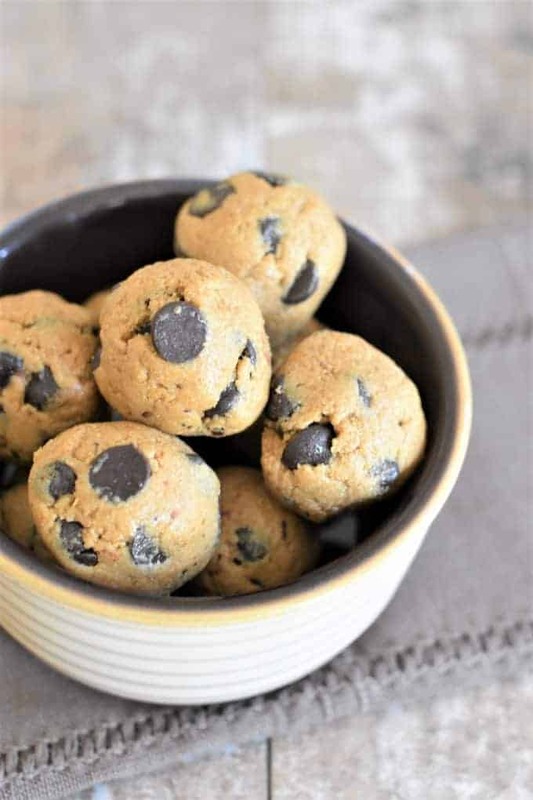 These Chocolate Chip Cookie Dough Bites are made of vegan, gluten-free edible cookie dough and feature an optional chocolate drizzle. You know, I never realized how difficult it would be to “bite” into a ball of cookie dough until I was faced with the task of taking a picture of it. I’ll admit, I definitely ate more than my fair share of these no-bake nom noms (for photography’s sake of course). But not everything involved in making these little bites of lusciousness was all rainbows and chocolate chips. For some strange reason, I hadn’t written down the exact measurements. Doh! Palm to the head! Well, I was very mistaken and shaken (LOL – couldn’t help it) by the cookie dough catastrophe. So, I did the only thing I could think of…I attached a memory machine to my brain and found the recipe! Well, I guess it was more of a nervous “no-bakedown,” but whatever! After some retesting, and LOTS of tasting, I finally remembered the correct measurements and all was right with the world. Sorry, too much watching of A Christmas Story this past holiday season. That dang TBS! On top of that, they require only seven ingredients (eight when made with the optional drizzle)! First, line a baking sheet with parchment paper and set aside. Add unsweetened applesauce, coconut sugar, pure maple syrup and vanilla extract to a mixing bowl. Stir in oat flour and salt. 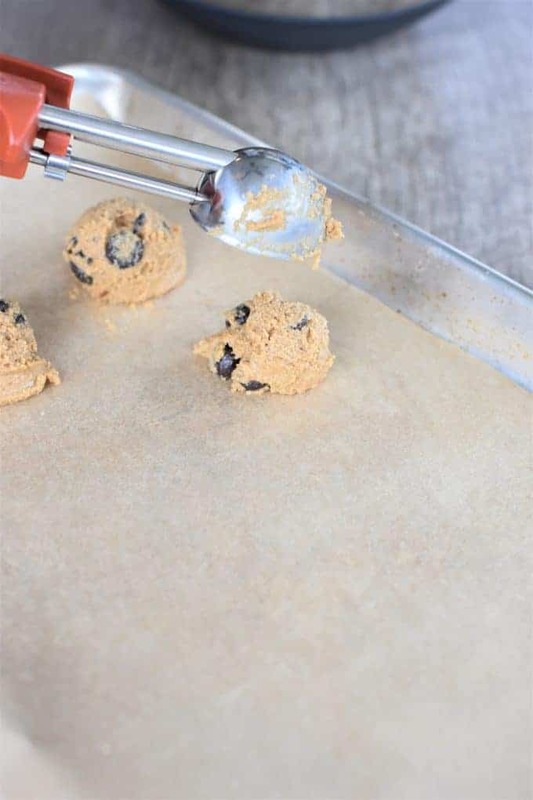 Use a small cookie scoop to scoop out dough. Form dough into balls with your hands and place onto parchment-lined baking sheet. If using the chocolate drizzle, combine chocolate chips and coconut oil in a small, microwave-safe bowl. Microwave in 15-second intervals, stirring between each one, until chocolate is smooth. Set aside until ready to use. Dip a small spoon into the melted chocolate and using a back and forth motion, drizzle a line of chocolate across the top of each cookie dough bite. 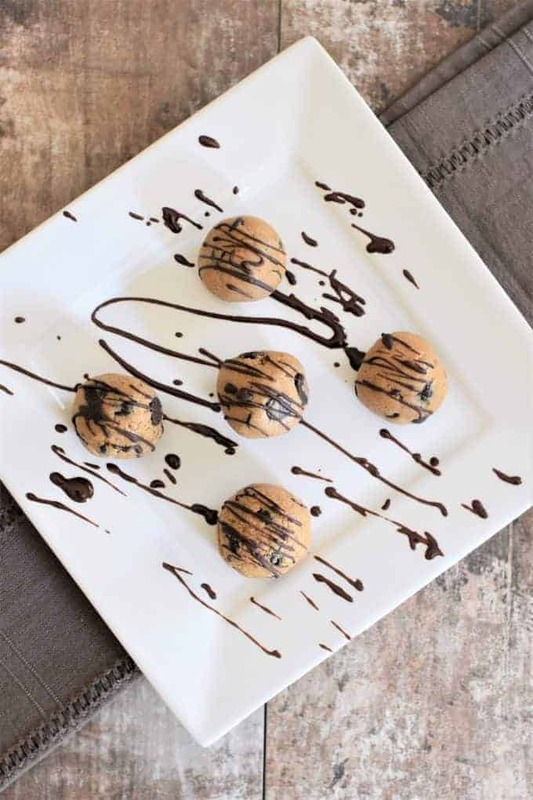 These Chocolate Chip Cookie Dough Bites are made of vegan, gluten-free, edible cookie dough and feature an optional chocolate drizzle. Place cookie dough balls on baking sheet in freezer for 10 minutes. 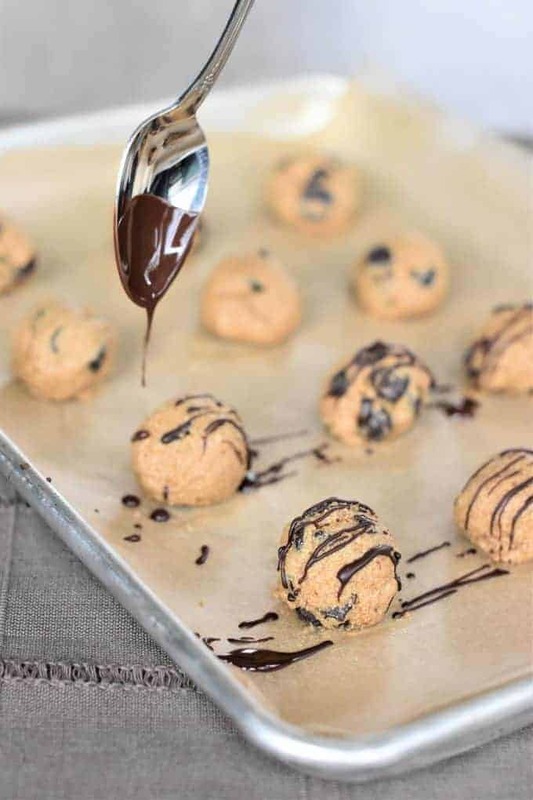 If using the chocolate drizzle, make while cookie dough bites are in the freezer by combining 1 tablespoon chocolate chips and coconut oil in a small, microwave-safe bowl. Microwave in 15 second intervals, stirring between each one, until chocolate is smooth. Set aside until ready to use. Dip a small spoon into the melted chocolate and using a back and forth motion, drizzle a line of chocolate across the top of each cookie dough bite. Repeat going in the other direction, if desired. Keep cookie dough bites refrigerated in an airtight for up to five days. They can also be kept in an airtight container in the freezer for up to 2 weeks. These are so great to keep in the fridge. And so super easy! This looks yummy and delicious. Love the no bake and healthy options used. Looks amazing. OMG they look so good! I think I’d pop a whole tray full of them in my mouth! Cookie dough treats are always so fun (love it in ice cream!). Love the ingredients you’ve used for your treats! It wouldn’t be the first time I either forgot to write down the recipe or couldn’t find the right note book and had to start again. These look lush. Sharing them now.